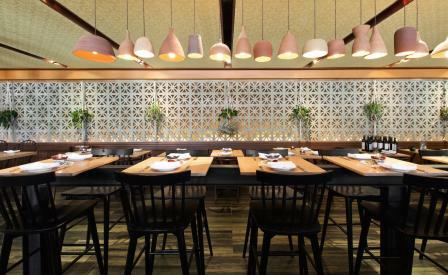 After a career working as the head chef in a series of LA-based eateries including Cyrus and Fig, Ray Garcia has ventured out on his own with debut restaurant Broken Spanish. Fellow Angelenos and interior studio Bells + Whistles worked closely with Garcia, using his Mexican-American heritage as a background for their clean, modern style. The light-filled rooms are based on a foundation of concrete and red oak, embellished with pretty hanging ceramic lamps and plants, as well as household furniture to lend a homely touch. ‘We aimed to create an interior that felt like your favourite abuelita’s house, with lots of texture and tchotchkes but with more modern materials and colours,’ explains co-designer Barbara Rourke. Our favourite touch is the wraparound marble bar, where diners can watch cooks whip up dishes that resound with Garcia’s heritage and the terroir of Southern California – dishes like moronga (blood sausage) with peach and arugula show off the kitchen’s dynamism, while crowd pleasers like an ethereally light goat’s milk flan with pistachio and roasted apricot keep locals returning for seconds.